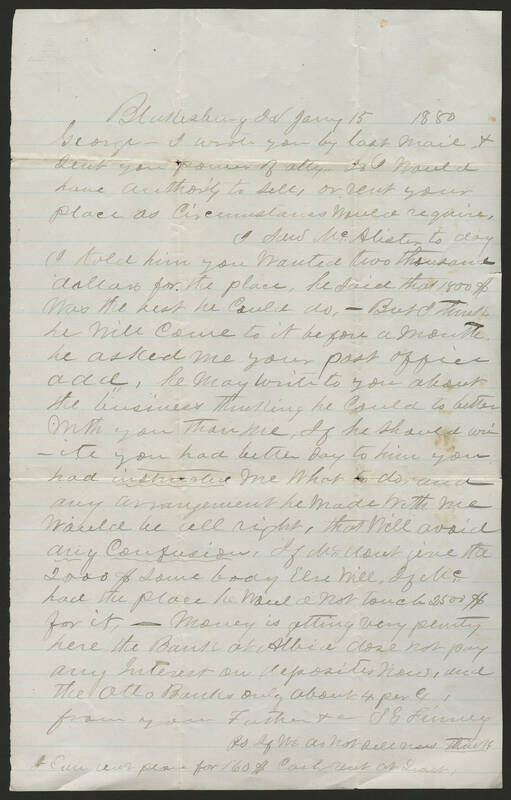 Blakesburg Ia Jany 15 1880 George-I wrote you by last mail & sent you power of atty. so I would have authority to sell, or rent your place as Circumstances would require. I saw McAlister to day I told him you wanted two thousand dollars for the place. he said that 1800$ was the best he could do.- But I think he will come to is before a month. he asked me your post office add. he may write to you about the business thinking he could to better with you than me. If he should write you had better say to him you had instructed me what to do, and any arrangement he made with me would be all right. that will avoid any Confusion. If Mc dont give the 2000$ some body else will. If Mc had the place he would not touch 2500$ for it.- money is getting very plenty here the Bank at Albia dose not pay any Interest on deposites now, and the Otto Banks only about 4 per C. from your Father &c G S Finney PS If we do not sell now think I can rent place for 160$ cash rent at Least.